The Tax is here now. There are so many predictions of another market downturn with some experts predicting it will last until 2021/2. Who is going to commit to a high end purchase now and not wait out for the free fall? In the case of Bellewoods, ground has not been broken. Will the developer or project financier look to push back construction timing if sales fall flat? Isn't this the third time you have asked essentially the same question? Excavation was never scheduled to start until later in 2018, with completion in late 2021. Yes, the schedule has now been pushed out a few months, but that's not unusual (construction start in Dec/Jan). Abstract has been launching Fifteen88 and working on Black & White and its' Bowker Collection projects. Yes, pre-sales have some risk attached, but that is driven by what your ownership horizon is. If the schedule gets shifted materially it will impact sales, but they are no where near that at this point. Smaller, high-end buildings are a niche market, and are generally less impacted by interest rates. Also, I don't believe foreign buyers are a factor on this project. They would be more inclined to larger projects on the harbour with an ocean view. Methinks nobody should be bothering to worry about this one. It's a small project and the site was null before. It's not even on a corner. If it happens as planned, great. If it doesn't, we wait a bit longer. Bellewood is now 50% sold-out. I thought it was sold out. Isn't it only 5o or 60 units total? In the Oaks building (the higher end phase) there are 51-suites, 23 in Cypress and nine townhomes. Celebration of Life for the TREES at 1201 Fort Street: Sunday, January 20th, 7 - 8 p.m. Happy 2019 to you community movers and shakers! I’m writing to ask if you would each kindly share with your networks the attached invitation to attend during Sunday evening's lunar eclipse, a Celebration of Life to honour the trees at 1201 Fort Street that have served us so well for more than 100 years. All at what cost to the climate? Grace Golightly of the Community Trees Matter Network cites in the above Focus article, research from Ohio State University suggesting that it would take “ .. a total of 269 two-inch-diameter trees to replace the carbon sequestration provided by a single 36-inch mid-sized tree.” So much for the effectiveness of those two-inch saplings in protecting us from climate change. Also in the Focus article, Golightly adds that “I think it’s essential that the City purchase well-treed properties that come up for sale. They can either be covenanted and re-sold, or made into mini-parks where more trees could be planted to increase the carbon storage and benefits to the neighbourhood.” Her position aligns with Victoria’s pre-real estate boom, Urban Forest Master Plan, that states, “The single greatest impact to the urban forest comes from the incremental loss of green space associated with development and densification (and that) as land use change and neighbourhoods are redeveloped, it is critical to ensure that adequate greenspace is being reallocated on-site or elsewhere to sustain the future urban forest.” Yet, in spite of the UFMB, urban forest expansion has not happened in tandem with development. In fact, according to Campbell, most of the UFMP’s 26 recommendations have not beenimplemented. This Sunday, January 20th, we will celebrate with tributes, poems, songs, musical instruments and love, the many gifts that the trees have given us: fresh oxygen, carbon capture and storage, beauty, serenity, shelter for wildlife, enhanced biodiversity, flood control, water table preservation, a buffer from wind and noise, shade in the summer and in general, relief from the urban environment. We also hope to express a sense of urgency for a needed change of direction at City Hall. Thanks in advance for your assistance in circulating the attached invitation. If this was anywhere else but Victoria, I'd assume the above was a story from The Onion. Oi Vey. They are two of the neighbors who were part of the group opposed to development of the project. No, not according to VicMap. Still in process. Clock is ticking down to deadline of February 11, 2019 to file an amendment to the Disclosure Statement that sets out particulars of the issued building permit. the tc has a 6-sentence article today about trees coming down at bellewood park. Fifty-six per cent of the site will remain open space. Edited by Victoria Watcher, 20 February 2019 - 09:30 AM. As the deadline passed (February 11,2019) for an amendment to the first disclosure, what are the implications for the builder and for purchasers? I believe the final date for the builder to submit an application for a building permit to the city is May 11-2019, which would be one year from the date of the first disclosure issue. They now have a blasting permit and an excavation permit, and the building permit process has been underway for some time, so presumably it is close to issuance. They must have obtained tree permits in order to start removing protected trees. I would expect that they will start digging and blasting as required in the very near future, with new construction to follow. In that case they simply file an amendment to the disclosure statement, send it to buyers and carry on. If all that was to take longer than May 11th, then they risk losing buyers, but that doesn't appear to be what's happening. 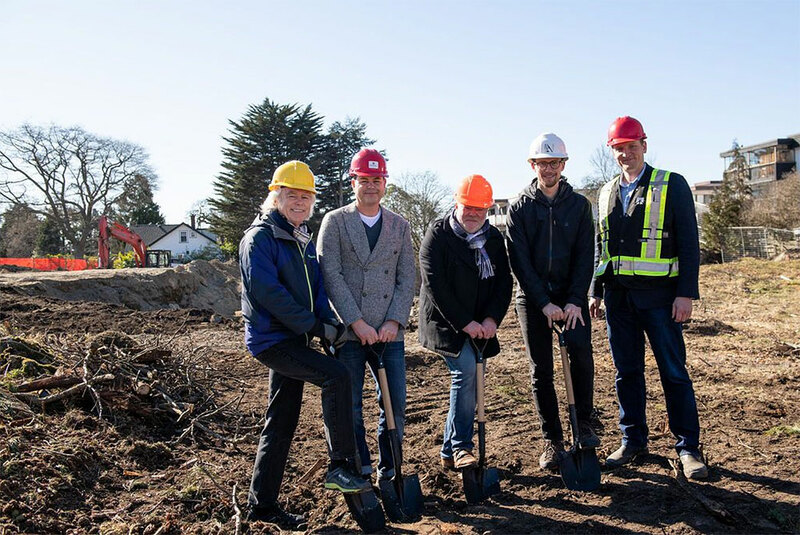 The Abstract Developments team celebrates the construction start of Bellewood Park, an 83 residence condominium and townhome project along upper Fort Street in Victoria's Rockland neighbourhood. Construction of Abstract Development’s Bellewood Park condominium and townhome project is officially underway along Victoria’s upper Fort Street corridor, Citified has learned. Comprised of 74 one, two and three-bedroom homes throughout two boutique buildings and nine townhomes, Bellewood Park’s well-appointed residences will rise on a nearly two-acre parcel in the historic Rockland neighbourhood known for landmarks like the Craigdarroch Castle, Government House and the Art Gallery of Greater Victoria. 5 guys and 4 shovels; this one is going to take a while. At 50% sold and in a market that could slow further, was proceeding with the project wise at this time? Just a question?? Starting construction at 50% sold-out is a fairly standard practice.